A while back I came across a deal on a Honda CRF70 and had to jump on it. As it didn't have a throttle restrictor I opted to keep Jakob on the CRF50F for a while longer until he got used to using the throttle. Having the CRF70 was nice though because it enabled me to chase him around and work with him, as well as being right there in the case of a crash. 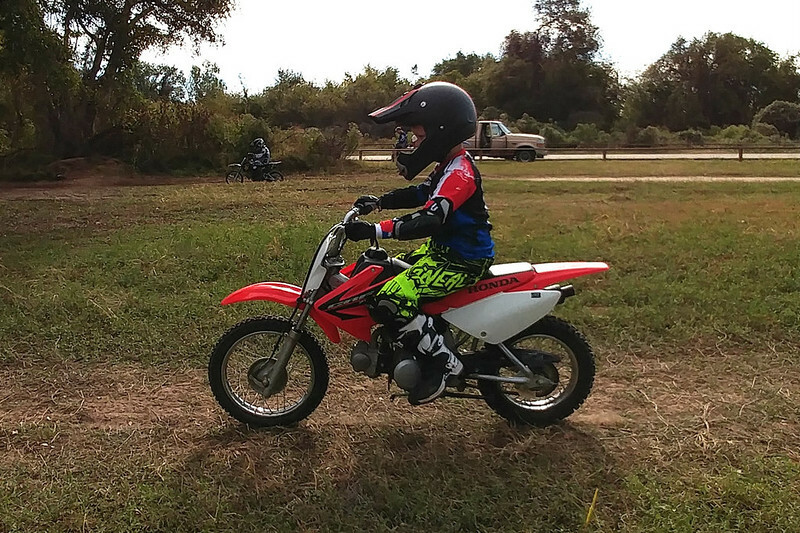 Last time we were out, we got him fully unrestricted on the CRF50F throttle, so while out this past weekend, I thought it was time to let him try out the bigger bike. Well, now he wants nothing to do with the old bike. Thanks to a bigger frame and bigger wheels, he says that the 70 is "Less wiggly." He's doing a lot of riding on the sand, and having ridden both bikes in said sand, I can agree with his assessment. It's also good to see that he can feel the difference in that manner too. So, now I have motivation to get my bike up and running as I'm NOT chasing him around on the 50, I'm way too big for that bike, and it needs to go up for sale so we can get mom a bike. Also note, he's already grown out of his expensive pants! Same pants in the picture but with a different pattern on them.